Robert Korngold, Ph.D., is Deputy Director and Member of the Center of Discovery and Innovation. 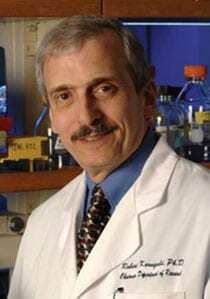 Dr. Korngold’s training and experience over the last 40 years have been in the field of immunology, with a focus on T-cell immunobiology related to allogeneic hematopoietic cell transplantation (HCT)—including graft-versus-host disease (GVHD), graft-versus-tumor (GVT) responses, immune reconstitution, and immuno-therapeutic approaches. His group has developed several important murine models for GVHD directed to minor histocompatibility antigens (miHA), and provided the evidence that mature donor T cells in the HCT graft were responsible for causing GVHD. They also generated models for studying GVT responses and have focused on developing selective approaches to favor GVT responses with minimization of GVHD risk. More recently, Dr. Korngold’s laboratory has been studying T cell repertoire and immune cell analysis of peripheral blood samples from patients undergoing autologous and allogeneic HCT for the treatment of multiple myeloma and other hematologic malignancies.